We’d love your help. Let us know what’s wrong with this preview of Death Expands Us by Stephanie Harris. The loss of a loved one leaves an empty space in our lives that can’t be filled. Stephanie Harris is a professional grief coach who has experienced profound loss in her own lifetime. She understands firsthand how the death of someone close can leave the living feeling victimized, isolated, trapped, and traumatized. She also knows that tragedy can be a powerful catalyst for The loss of a loved one leaves an empty space in our lives that can’t be filled. Stephanie Harris is a professional grief coach who has experienced profound loss in her own lifetime. She understands firsthand how the death of someone close can leave the living feeling victimized, isolated, trapped, and traumatized. She also knows that tragedy can be a powerful catalyst for positive change. Life will always go on after a death, but the loss of someone we dearly love changes us, profoundly and permanently. Only by taking responsibility for our own lives and embracing this transformation can we hope to find peace and freedom. When we grieve, our pain holds us captive. This essential work can open our eyes to possibilities that will set us free. To ask other readers questions about Death Expands Us, please sign up. Engaging, valuable and practical work. Read it when you are ready. 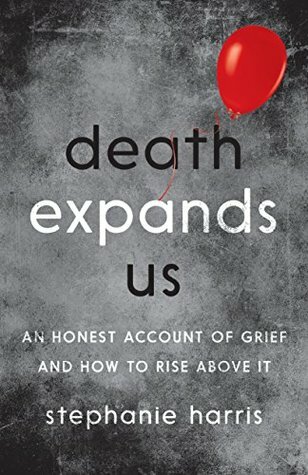 This is a book about grief related to the loss of a loved one, though i believe it could be valuable to help grief brought about by trauma or severe change as well. Wonderful book for anyone needing or wanting a new perspective while they navigate all that comes with the loss of a loved one. Stephanie Harris makes available support and a different perspective by sharing her story of overcoming the hardships that showed up following the sudden death of her brother Brendon. If you are grieving, read this book.